it will then appear as a separate toolbar. From here, you can move it to wherever you like on the screen or you can dock it. To dock it, drag it to the top or either side of the window until the Docking Icon appears. Drag the Command Manager to the icon and release your mouse to dock it. To un-dock it all you have to do is double click the Command Manager and then move it to your desired location. 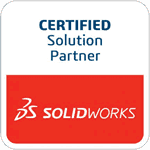 This is an easy tip that can help you out by customizing and opening up your SolidWorks workspace.